In the United States, 40 percent of food goes to waste. Thanksgiving is a celebration of family, football, and most of all, food. While we prepare for the feast, it’s also important to consider the amount of food wasted on this particular holiday. Natural Resources Defense Council’s Staff Scientist Dana Gunders explains, “During the holidays, people are often confronted with more food than they can eat, meaning food gets wasted.” Fortunately, there are many ways that you can limit the amount of food wasted at your house on Thursday. Saves resources – Wasted food wastes the water, gasoline, energy, labor, pesticides, land, and fertilizers used to make the food. When we throw food in the trash, we’re throwing away much more than food. Reduces methane from landfills – When food goes to the landfill, it’s similar to tying food in a plastic bag. The nutrients in the food never return to the soil. The wasted food rots and produces methane gas. Methane is a strong greenhouse gas with more than 21 times the global warming potential compared to carbon dioxide. Returns nutrients to the soil – If you can’t prevent, reduce, or donate wasted food, you can compost. By sending food scraps to a composting facility instead of to a landfill or composting at home, you’re helping make healthy soils. Adding compost to gardens, highway construction sites, and poor soils makes great things happen. Properly composted organics (wasted food and yard waste) improve soil health and structure, improve water retention, support more native plants, and reduce the need for fertilizers and pesticides. So as part of showing thanks to our American food bounty, consider the following strategies to help you avoid wasting it this year on Thanksgiving. While you don’t have to get get too stressed out, it can be helpful to plan your menu more thoughtfully. Coordinate recipes with friends and family so you don’t end up with 3 green bean casseroles (unless if you want 3 green bean casseroles!). Setting up a shared Google Doc is a great way to simultaneously plan the meal with the friends and family you’re sharing the day with. Prepare less by cutting recipes in half. If you can’t have Thanksgiving without sweet potato casserole, but like me also “need” to make at least five other traditional side dishes, consider making a half recipe for one or all dishes, instead of full recipes. Tips for halving recipes can be found here and here. Only buy the ingredients you need for your recipes. Buying in bulk is only really efficient when you actually need something in bulk. It’s hard to resist a two pound bag of pecans in the heat of the moment at Costco, so maybe remember ahead of time that you can get nuts by the scoop from your smaller grocery store. Avoid impulse purchases; I don’t really need a pre-baked apple pie from the bakery section when I know we already have pecan and pumpkin pies in the works! Consider selecting vegan or vegetarian recipes. 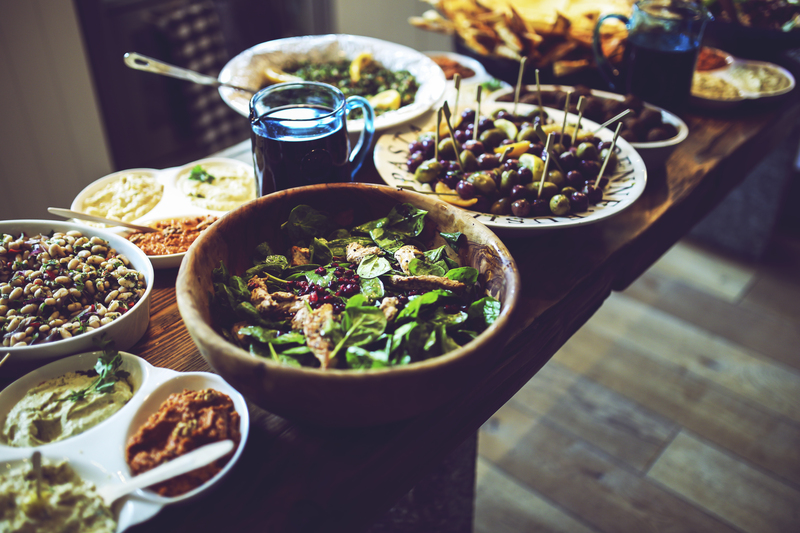 Avoiding actual food wastage is only one part of a sustainable food system; in order to support global food security for the future, societal shifts in dietary preferences are important to consider. The United Nations Food and Agriculture Organization (FAO) anticipates that “food production must increase by 70 percent by 2050 to feed an expected global population of 9.1 billion people with increasingly meat-dependent diets.” That’s because “animal products require 4 to 40 times the calories to produce than they provide in nutrition when eaten, mainly due to the crops they consume.” This creamy no bake pumpkin pie could be a great way to experiment if you’ve never made something vegan for Thanksgiving. Rethink how you peel and trim fruit and vegetables. It’s a tradition of French cooking to cut away the ‘unsightly’ bits of foods, such as trimming off the knob at the top of a beet or getting rid of the tops of green onions. However, this is often just a matter of aesthetics; you don’t actually have to peel everything. For example, it’s okay to leave the skins on root vegetables such as as carrots, beets, and potatoes. But you’ll likely still need to peel or trim thick squash and pumpkins, because they probably won’t soften enough during cooking. Changing these practices can decrease the amount of food that goes in the bin. Keep an eye on your food while it’s cooking and set timers; this way, the food is less likely to burn and thus less likely to get thrown out. Use up ingredients you may already have in your refrigerator before buying more. Sometimes, I forget I have a bag of celery buried in my vegetable crisper. If I buy more to make stuffing, I’ll be sure to use up the older bag first. If you are using ingredients you already have on hand, remember that expiration dates on labels don’t always relate to food safety. They often are the food producer’s suggestions for peak quality. If food smells, looks and tastes okay, it probably is. Freeze vegetable and meat scrapsto make homemade stock or broth at a later date. If you can’t make use of scraps,compost them. The EPA has a great home composting reference here to set up a compost pile in your backyard. It’s easier than you think! Some communities also have composting facilities so you can put compostables in a bin at home to be picked up, or you can drop off your food scraps at a specific location. Get creative with leftovers so that you’re more likely to eat them. You may appreciate recipes for a Thanksgiving burrito, waffles made of stuffing, David Chang’s mashed potato spring rolls and sweet potato and cornbread hash. If you don’t want to eat all your leftovers right away, try freezing them so you can have them anytime you want later on. Maybe give your animal companion a special treat instead of her or his usual meal (be cautious: in addition to chocolate, dogs don’t digest onions and garlic well, and grapes are poisonous). Donate shelf stable food items you don’t end up using. Food banks covet holiday-related canned food like cranberry sauce. Compost your leftovers if they spoil, or if you can’t stand the sight of them any longer (most leftovers should stay fresh until Sunday or Monday). Honor the food that feeds your family on this holiday about gratitude. We’re so fortunate to be able to avoid waste in the first place!